Woman says Neil Armstrong gave her moon dust. She's suing NASA to keep it. Laura Cicco claims the moonwalker gave her the memento when she was a child. In a case that mixes nostalgia with serious questions about who is allowed to own materials brought back from space, a Tennessee woman is suing NASA to maintain possession of what she says is a vial of moon dust that astronaut Neil Armstrong gave her when she was 10 years old. Cicco, then named Laura Murray, claims she received the memento while living with her family in Cincinnati. She maintains that Armstrong, who taught aerospace engineering at the University of Cincinnati at the time, had been a friend of her late father. Armstrong died in 2012. A handwriting expert authenticated the signature on the note, said Cicco’s lawyer, Christopher McHugh of Kansas City, Missouri. Tests of the vial's contents found that "there is no evidence to rule out a lunar origin," according to the court documents, but terrestrial materials from Earth's crust were also identified in the sample. Cicco told the Washington Post that she had lost track of the vial until five years ago, when she rediscovered it in her father’s belongings after his death, and that she had filed the suit in an effort to block NASA from trying to seize the moon dust. The space agency declined a request by MACH to comment on the case, but it has a reputation for aggressiveness in its efforts to take possession of lunar samples held by private citizens. In one highly publicized case from 2011, NASA conducted a sting operation in Lake Elsinore, California, to seize paperweights containing slivers of moon rock that a 74-year-old woman was trying to sell. 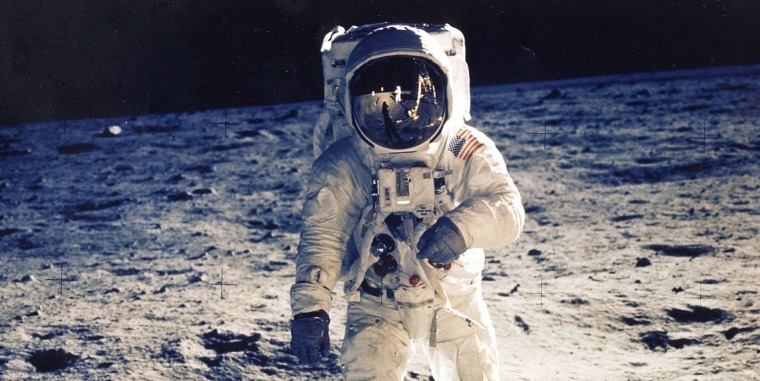 “Lunar samples that have been collected by U.S. government missions are considered unique and limited natural resources,” said Michelle Hanlon, co-founder of For All Moonkind, a nonprofit dedicated to preserving the Apollo lunar landing sites. “NASA retains all lunar samples collected through U.S. government missions as NASA property.” Hanlon is not involved in the case. The outcome of Cicco's case will hinge on whether Armstrong or the government owned the dust at the time it was given, according to Christopher Johnson, a professor of law at Georgetown University in Washington, D.C. and a space law expert. “If it’s the property of the U.S. government, he could not have passed it along to somebody else — he didn’t have the correct chain of custody or title for that,” said Johnson, who is not involved in the case. If there are no federal statutes against private ownership of materials from space, other experts say international law may provide some guidance. The Treaty on Principles Governing the Activities of States in the Exploration and Use of Outer Space, signed in 1967 and commonly called the Outer Space Treaty, prohibits governments from claiming territory on the moon and other celestial bodies. It is recognized by 107 countries, including the U.S. and Russia. NASA now has 60 days to respond to the lawsuit.